Island of the Moon Apiaries California Local Wildflower Honey is, hands down, our most popular honey. It is a bold, natural blend of floral sources from throughout the Sacramento Valley. This honey will change slightly in color and flavor throughout the year. In general, however, it is an amber colored honey with a full-bodied flavor, including notes of caramel and licorice. 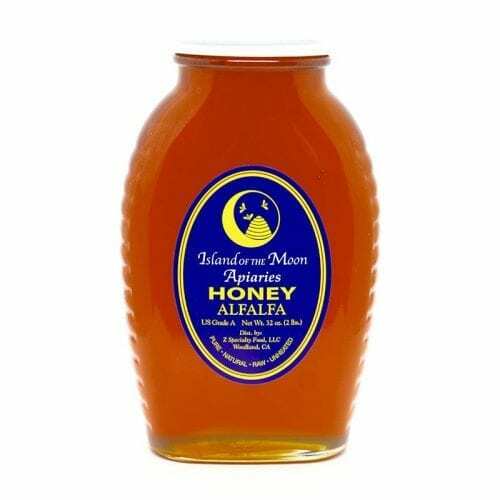 Island of the Moon Apiaries California Wildflower Honey is a great choice for tea and any fermentation or baking project. We proudly supply this honey by the bucket (60 pounds) and by the drum (650 pounds) to breweries, meaderies, bakeries and restaurants throughout the country. What do you mean ‘Local’? Well, it’s local to us and our home. If you live in California anywhere from Fresno to Santa Cruz to the Bay Area to Redding to the Tahoe/Truckee Area and back down to Sacramento, then you can call it local, too. Even if you don’t live in Northern California, we’ll still let you order it (and eat it).